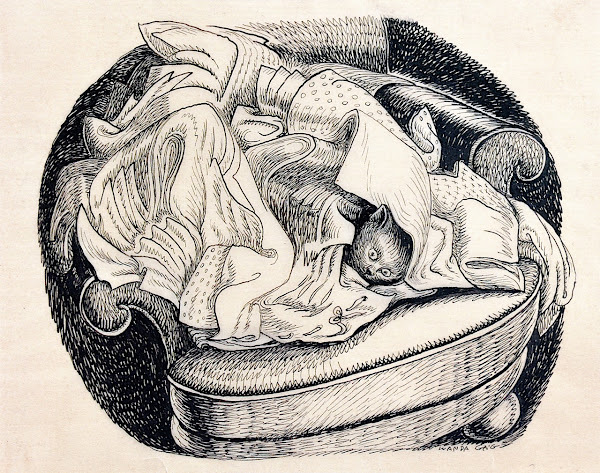 Random Noodling: Ekphrastic April 2019, Day 13: "Cat Hiding in a Laundry Pile"
Ekphrastic April 2019, Day 13: "Cat Hiding in a Laundry Pile"
Millions of Cats is one of my all-time-favorite picture books. I remember it from my childhood and these lines will always be accessible to my aging brain: "Hundreds of cats, Thousands of cats, Millions and billions and trillions of cats." Today I have a pen and ink sketch by Millions of Cats author/illustrator, Wanda Gág. "Cat Hiding in a Laundry Pile" (date unknown) by Wanda Gág [1893-1946]. The artist uses an abundance of curves--it provides a comfy feeling in the viewer, don't you think? I still have our copy of Millions of Cats. Wanda Gag was a wonderful artist, evidently loved cats! My daughter and son-in-law have 5 cats, and last night the most gregarious one was right in the middle of Ingrid opening gifts. Distracting, yes! Love this, Diane. Thanks, Linda! Since I'm allergic to cats, I think five might kill me!